Definitely Japan. Definitely Kojie.san - Triple Joys!!! As most Filipino women are naturally tan in color (kayumanggi), many are wanting to have fairer, whiter skin, thus, the rise of many skin products to address this need. to treat certain skin problems such as severe melasma and hyper pigmentation. But the day came that the power of Kojic acid had been found to be really effective. And one of the pioneer in this market is Kojie.san. Kojie.san is the first kojic acid soap to be commercially available in the Philippine market. I still remember the first time that I encountered this product, I was in a Watson store then. This bar soap really caught my attention because of the simplicity of its packaging - mostly white with a little bit of black and red prints. The price was very attracting too! It used to sell for P50.00 for two bars! Budget-friendly, right?! Now, it is selling for P120.00 for three bar soap. Still very much affordable. But, what really is Kojic acid? What makes it a very effective whitening component? Kojic acid is an all-natural compound derived from fungi – sort of like mushrooms. That means that kojic acid is completely natural and not something that’s man-made in a laboratory by a group of scientists and dermatologists. It contains antioxidants and 100% all natural ingredients. It does not contain any harmful chemicals. 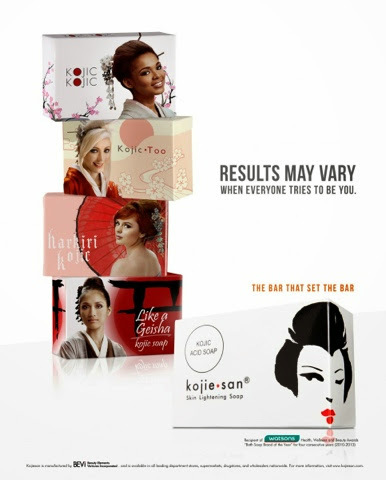 Pioneering Kojic acid soaps here in the Philippines, Kojie.san still holds its dominant post in the market despite the mushrooming of many competitors. This is one strong proof that Kojie.san truly lives up to its promises. It had already gained the trust and confidence of its target markets ( and that includes me!). Surely, nothing really beats the original! Just as how the old cliche goes, "why settle for less, when you've already got the best?! ".